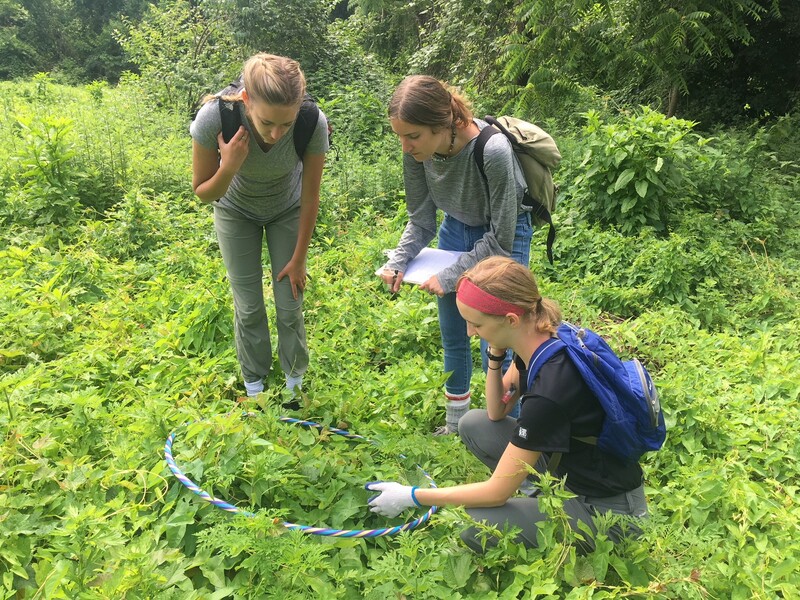 The 2018 summer interns were Emily Manning, an environmental studies major with a minor in public health at Elon University; Sofi Solomon, an environmental studies major at Michigan University and Abigail Bezrutczyk, an environmental science and plant science major at Cornell University. Each intern brought a unique set of passions, knowledge and experiences to the job. Throughout the summer, the Joyce and William O’Neil Stewards familiarized themselves with Land Alliance preserves, expanded their knowledge of local ecosystems and aided in educational programming and trail maintenance. They worked on removing invasive vines from the Hope Goddard Iselin Preserve, conducted plant surveys on the Humes meadow and updated trail maps using GIS. Their key projects included conducting tree surveys to identify ash trees that are vulnerable to the invasive Emerald Ash Borer. By tagging and mapping these trees using GIS, the Stewards set the baseline for monitoring ash tree health in the years to come. Their crowning achievement was the transformation of an outdated interpretive trail at the Iselin Preserve. The trail now includes 13 posts that correspond to information about the local flora and fauna that can be found in the preserve along with notes on the preserve’s history. They also designed an informational brochure which has been added to the kiosk box for all ages to enjoy. The Land Alliance is also pleased to host its first fall O’Neil Steward intern: Barbara Davaros. Barbara is a recent graduate of SUNY Oneonta, where she studied biology with a concentration in ecology and conservation. Barbara has been assisting our stewardship team with preserve maintenance, monitoring conservation easements, conducting plant surveys, helping with our Long Island Water Education Program and researching protocols for harvesting and processing seed from our preserves for future planting. For more information about the Joyce and William O’Neil Stewards Program, please contact the Land Alliance at 516-922-1028.